Politicians are blaming immigrants for overcrowding and lack of services in cities like Sydney and Melbourne. New Prime Minister Scott Morrison has been joined by NSW Premier Gladys Berejiklian in suggesting migrants are forced out of the cities and into regional areas. This follows more open scapegoating from the likes of Tony Abbott, who declared earlier this year that immigration was to blame for “unaffordable housing and stagnant wages”. Some unions have also called to restrict workers on temporary visas from coming here. Temporary workers are too easily exploited and undercut wages, they claim. Workers on temporary visas are in a precarious position with fewer rights than permanent migrants. But bosses have always tried to exploit migrant labour, whether of temporary or permanent migrants. Instead of trying to keep them out, we need to organise migrant workers into the unions and forge a united fight for decent wages and more secure working conditions, including the right to permanent residency and an end to the threat of deportation. There is a fine history in Australia of migrant workers standing up for their rights at work, often leading militant and explosive strikes. As the government loosened immigration restrictions after the Second World War, tens of thousands of migrants began arriving from across southern Europe. They often faced racism and discrimination at work. New migrants were usually at the bottom of the social ladder, forced to do the hardest, least safe and worst paid work. At first many union officials paid little attention to trying to involve them in the unions. There was little done to make sure, for instance, that they had translations so they could understand what the union was doing. And like today, there were some unions who made little effort to reach out to new migrants or stand up to corporate exploitation. This meant anger from migrant workers often led to explosive struggles—as they were frequently forced to fight their own union officials as well as the boss. One example was at Queensland’s remote Mt Isa mine. Work here had always been hard. Even before the dispute half of the 4000 workers quit in one year. 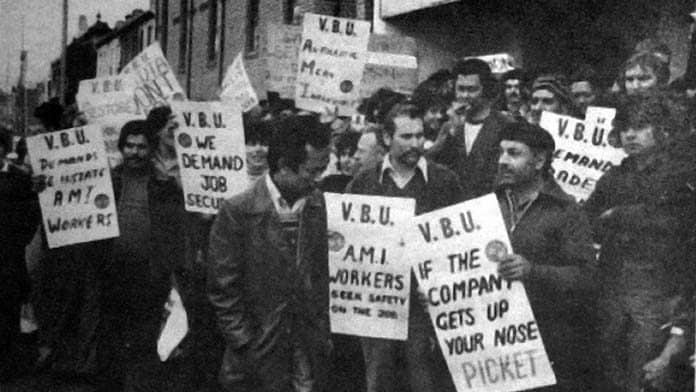 In 1964 a mostly migrant workforce including 40 nationalities staged a months-long rebellion against both their bosses and AWU union officials. Although they were forced back to work, the bosses eventually increased wages and improved conditions. But the most famous is the strike at Ford’s Broadmeadows plant in Melbourne in 1973, where recent migrants were 80 per cent of the workforce. Anger at appalling working conditions exploded when 1500 striking workers fought police and trashed a section of the factory, then forced union officials to declare an indefinite strike that lasted 11 weeks. The workers won a dramatic victory, with a wage increase, more toilet breaks and a slowdown of the assembly line. The car industry at the time employed thousands of unskilled migrant workers across half a dozen major companies, producing almost half a million cars a year by 1970. The 1973 strike was the third major strike at Ford, following a two week strike in 1963 and another for three weeks in 1969. Some migrant workers had experience of union militancy from home. At the AMI plant in Port Melbourne in 1973, workers began to suspect the line was being sped up so that management could get more than the usual number of 50 cars completed in a day. At this time the factory employed a number of Mauritian, Spanish and Yugoslav workers, and the Spanish workers set the example in forcing the issue. “The Spaniards who had led the action had been members of the illegal workers commissions that had organised mass strikes against the Franco regime”, Tracy said. By 1982, around 60,000 Vietnamese refugees had arrived in Australia, the first wave of large-scale Asian immigration. At the time, many on the left opposed their arrival, since they were mostly supporters of the US puppet government in Vietnam, fleeing the Communist takeover when the US lost the Vietnam War. The Labor Left MP Tom Uren even dismissed them by saying, “A lot of the refugees are coming here for a softer life.” But in Australia the bulk of them were pushed into working class jobs in car factories or as mail sorters. And like previous generations of migrants they also showed their willingness to strike and stage militant union action. In August 1980, 1500 workers at the AMI-Toyota car plant occupied the factory for ten days, demanding reinstatement of three workers sacked for supposed “abuse” of sick leave and the right for a union official to visit the plant. The three workers sacked were all union militants—and one of them, Le Ban-canh, was a Vietnamese migrant. “Le was sacked when he had badly gashed the forefinger on his right hand with an air gun”, socialist newspaper Direct Action wrote at the time. “Although the finger was still badly bleeding, the company nurse told him to go back onto the line to work. There had been a history of this sort of treatment of injured workers—with one worker on sick leave after catching bronchitis from fumes in the factory sacked a few months earlier. One worker told The Battler, “The spot welding causes sickening fumes, but many of the workers have only eye goggles. Vietnamese workers were one of the largest groups of workers in the plant, among migrants from 20 different nationalities. Management told them to have nothing to do with the union, or they would be refused overtime work. On the first day of the occupation, a group of 22 workers stayed in the plant overnight to keep the strike running. Two of them were Vietnamese. The whole group of occupiers were dismissed—but later won reinstatement. “The Vietnamese made signs in their own language, participated in the demonstrations, and generally gave strong support to the struggle”, socialist newspaper The Battler reported. Among the Vietnamese workers were some from more middle class backgrounds who had been students and teachers in Vietnam, as well as ex-members of the South Vietnamese regime’s army. But their experience of working in Australia in terrible conditions turned them into strong supporters of the union. After 16 days on strike, the workers forced the reinstatement of 22 workers sacked during the dispute, a union organiser was given right of entry to the plant, and better dismissal procedures introduced. Only one of the three workers initially fired got their job back, with the two other cases sent to arbitration. But it showed how new migrants could become staunch unionists—even when they came from right-wing backgrounds at home. When given the opportunity, migrant workers have embraced trade unionism. One area with a large migrant workforce, through to today, is the unskilled work in construction labouring on building sites. Recent migrants made up “perhaps 70 per cent” of the membership of the NSW Builders’ Labourers Federation (BLF) in NSW by the 1970s, journalist Pete Thomas wrote in his book Taming the concrete jungle. Under the left-wing leadership elected in the mid-1960s, the BLF published union material for its members in a variety of European languages, and pushed for, “programs to be carried out, paid for by the employers of government or both, to help migrants learn English, in the employers’ time on full pay, and to help them with any problems of social services”, he recorded. Jack Mundey, the union’s secretary and architect of many of its famous green bans, described how it was involvement in two big strikes in 1970 to demand safety at work that really began to give migrant workers a prominent role in the union. “The mass meetings, at which up to half a dozen interpreters relayed all resolutions, broke down chauvinism and racism. “The migrants felt that this was their union too. They were becoming involved on all levels, as delegates, organisers and members of the executive committee,” he wrote. The union also appointed as organiser a Portuguese-born migrant, Viri Peres, able to speak not only Portuguese but Italian, Spanish, French and English, in order to better communicate with members. Migrant workers have often experienced exploitation at work. But this history shows there is a proud tradition of migrant workers’ own struggles against it. And there is also a tradition of trade unions and socialists organising them into the unions for a common fight for better wages and conditions. This is the approach we need more of in the unions today.